This Emulator will take any Google-Page-Rank-API resolve done by your SEO Tools and replace it with other metrics such as TrustFlow, CitiationFlow, SemRushRank, AlexaRank or YandexTIC. Make use of better ranking factors than the abounded PR. 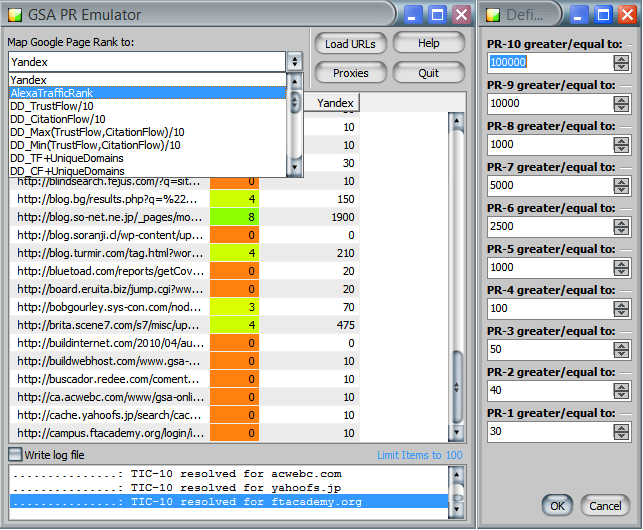 It comes with an excelent proxy scraper and other nice tools to filter imported URLs by your new metric data. It is a problem for many tools to get quality ranking factors since toolbarqueries.google.com was disabled by google in April 2016. With GSA PR Emulator every program will work like before and even better as the new metric data is way more often updated. Googles PR was not updated since 2013. There is no need to change anything in your other SEO Tools. It will be working instantly without any program change.